If I meet people they generally mention two things: the song after ’87 and when I kicked out on the full against Essendon in round two of 1993. The year 2018 marks the 25th Anniversary of the Baby Bombers’ premiership triumph. In that 1993 Grand Final, Essendon defeated their traditional rival Carlton by 44 points. However, given the recent woes of both clubs, this moment certainly feels like a distant memory. So perhaps it is more appropriate this week to reflect on the 25th Anniversary of another match, a match that neither team was able to win. Kernahan: The siren went, and I think that threw me. But I went back and I just tried to steer it through and I missed by a long way. Kernahan: Afterwards I took that really hard. I was as flat as a track because in my mind those are the things that I was meant to do. When it’s time to win a game, that’s what you’re meant to do. I think all guys in a similar role would say that’s what they pride themselves on. Kernahan: You wouldn’t believe it, but the week after the Essendon draw I take a mark and the siren goes again. We were four points down against Hawthorn, and low and behold, at the end of the game and the ball comes my way again. I was 50 metres out, and there was a massive gale down that side of the ground. I went back that quickly, because the siren was about to go, and I kicked the goal to put us two points in front. The ball went back to the middle, it was bounced, and the siren went. I let my emotions spill out because it had been a hard week. It was redemption in the space of seven days. But no one remembers the Hawthorn game, do they? Kernahan: Once more the Carlton players’ ability to celebrate long and hard stood the ultimate test. But one drawback of the ’87 premiership occurred at our local watering hole, Naughton’s Hotel, with my rendition of Tammy Wynette’s ‘Stand By Your Man’, which I knew word for word from the Blues Brothers movie. Former Channel 10 sports reporter Peter Donegan is a top bloke in TV circles, but I’ll never forgive him for getting the whole song down on videotape. That song still haunts me today, and what a demon the drink is. It has been tough going for Carlton in 2018. In the off-season they lost Bryce Gibbs to Adelaide and in the pre-season they lost Sam Docherty to a season ending injury. And then in the season proper they have had untimely injuries to both Matthew Kreuzer and Marc Murphy. That quartet represents the Top-4 in Carlton’s Best and Fairest from last year. The one constant on the field from last year’s Top-5 has been Kade Simpson. Like a fine wine, Simpson appears to be getting better with age. Simpson infamously failed to gain a possession in any of his first 3 games at AFL level back in 2003. Closing in on 300 games and celebrating his 34th birthday last week, could Simpson be on the way to his first All-Australian nomination this year? He has taken over from Sam Docherty as the go-to player out of Carlton’s defence. But has he been the best attacking halfback in the AFL this season? An attacking halfback should be judged on their ability to accumulate possessions in the defensive half and gain territory (preferably by foot) in an effective manner in order to break through congestion and transition from defence to offence. Played a minimum of two-thirds of matches this season. After Round 7, a player would need to have played 5 games to be under consideration. Achieved a minimum 75% Disposal Efficiency. Accumulated a minimum of 75% of their possessions in the defensive half of the field. This is in order to differentiate a halfback from a wingman, who gets the ball further up the ground but also has high kicking rates and metres gained. 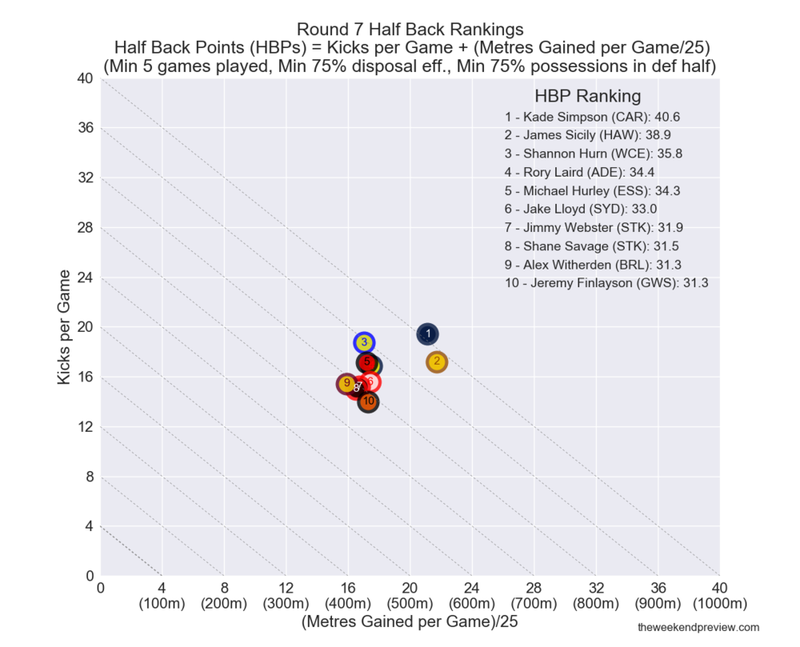 Based on the above, Figure-1 presents the AFL Half Back Rankings after Round 7. At the top of the rankings is Carlton veteran Kade Simpson, with James Sicily his potential teammate on the other halfback flank in the All-Australian team. Essendon, with Michael Hurley, also have a player in the Top-4. But perhaps it is not surprising that for two struggling sides that their best defenders are getting a lot of the football. Note: This article represents a continuation of a series of articles to determine the form players of the competition in each position. The premise is to assess each position based on an easily identifiable collection of variables. Each week the rankings will be updated and an All-Australian team will be auto-populated and presented on a stand alone page. So far, metrics for attacking halfbacks and key defenders have been developed. Carlton and Essendon are two teams in terrible form. Carlton may lack the cattle on the park, but in trying to go away from their defensive-first style from the last few years, they now appear to neither attack nor defend well. Essendon on paper appear to be full of talent but they are low on confidence and their methods are failing them. Poor coaching is not something that can be turned around quickly, so there may still be some pain ahead for both clubs. Carlton’s best hope this week is for a rain-affected match similar to what they had last year in their upset win over the Bombers. If conditions stay reasonably dry, Essendon will still have the edge. Kernahan. S. & De Bolfo, T. (1997). “Sticks: The Stephen Kernahan Story”. Random House Australia Pty Ltd, NSW, Australia.